This book contains records from the Cemetery Register from St. Joseph’s Cemetery, from January 26, 1969 to May 22, 1978. This book contains the burials at St. Joseph’s Cemetery from March 1931 to March of 1942. This book contains graves listed in the Death Register from May 1922 to March 1942 that are located in Sections A,B,C and D.
I have always wondered if there is something mystical about being the first-born daughter, of a first-born daughter, of a first born daughter, etc. 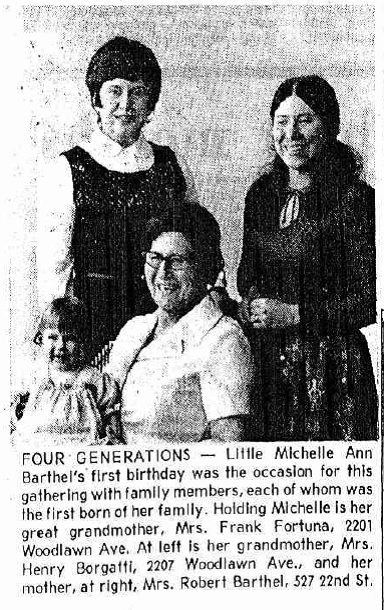 As far as I can tell by my research, my maternal line, the one that also carries my Mitochondrial DNA (passed only by mothers to their children) is a long series of uninterrupted first born daughters. Interestingly enough, I also gave birth, first, to a daughter. This special relationship was something that my family celebrated and I have been told that back in Italy things such as this are indicative of some sort of psychic prowess. The Abruzzo region, where my family originated, is known for its superstitious character so I am not surprised. Some things I have read have said it is the area in Italy most “prone to magic and superstition.” Bordered by the Apennines, Abruzzo is home to some of Italy’s wildest terrain. Silent valleys, vast untamed mountain plains and abandoned hill villages carelessly dot the ancient landscape today. Many unusual stories have been passed down and even in America we have a strong inclination toward unearthly things. 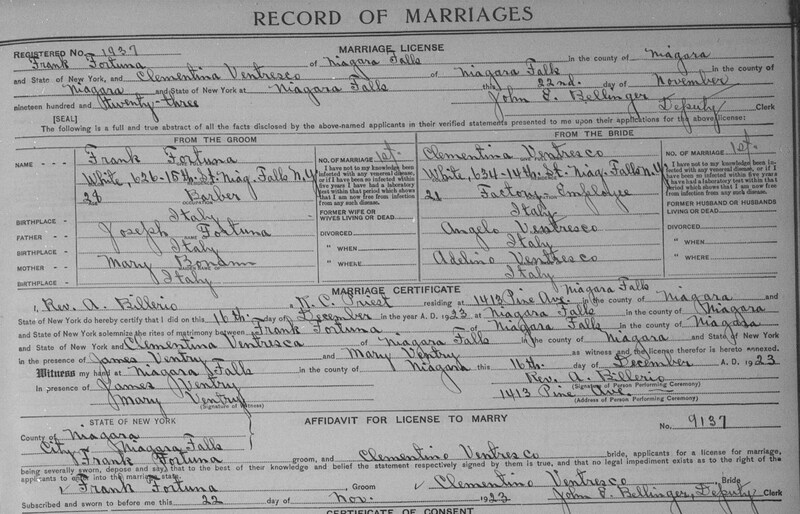 The furthest back in this special line of women–that I have had the privilege of knowing personally–was my great grandmother, Clementina Ventresca Fortuna. 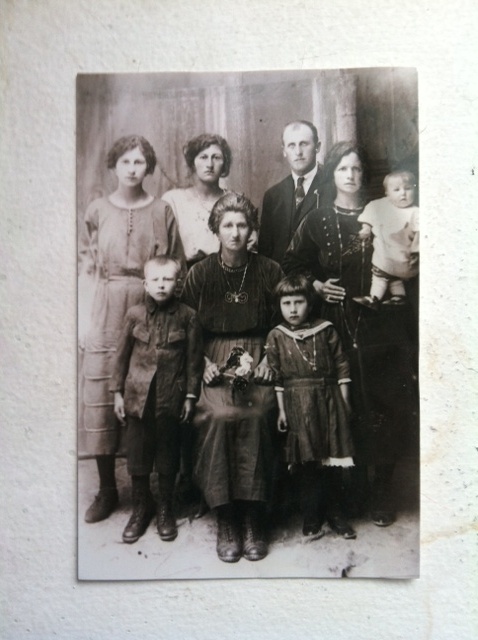 Her mother, Adelina, was also a first born daughter, however, she died a few years before I was born. Clementina was born in the small mountain village of Torre Dei Nolfi, in the province of L’Aquila, region of Abruzzo, on November 16, 1901. Her life in Italy was far from idyllic. The eldest daughter on a farm, there was much work to do. 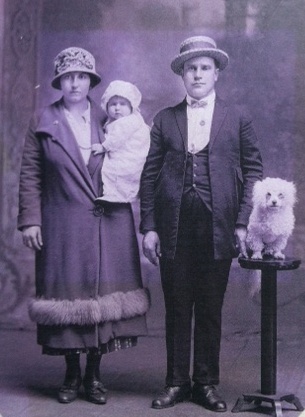 Her father, Angelo Ventresca, was often in America, or traveling across the ocean, earning money at various jobs in order to ensure the family’s survival. Adelina, his wife, was left with the arduous task of managing the farm with her daughters. Her only son, Vittorio, was one of the youngest, and could not help with the major work. Clementina, my great grandmother, was a shepherdess and she spent her days tending to the sheep that grazed the primeval hillside. In this sort of natural solitude, her needlework often kept her busy in her loneliness, and of course, there was that other notion to keep her going…the love of a young man. His name was Giovanino. He was a policeman from Rome and over the years this sad, sad story concerning unrequited love has been passed from generation to generation. I only knew my grandmother as an old woman, but every time I looked at her I imagined the young girl she had been, because of this story. It was really quite simple. They met, fell hopelessly in love, were forbidden to marry, threatened…and in the end he was dead and she was on a boat to America. Clementina’s youngest sister, my Aunt Phil (Felicetta) remembers how Giovanino would stand outside the window of their old stone house, in the garden, before the earthquake had struck, and he would sing his heart out to her sister. In my imagination, my grandmother was Juliet and poor desperate Giovanino was Romeo. A love so beautiful as theirs was destined for tragedy. The family was set against Giovanino as she had been promised in an arranged marriage to another, the son of the most powerful man in the village. But Clementina was not prepared to surrender. She embodied the stubbornness that we all share today. 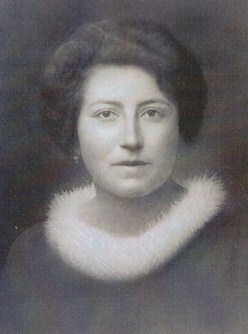 Even as various relatives did their best to instill fear within her, and even as another cousin who had also attempted to break with tradition and marry the man she had loved was brutally murdered and her body left in Clementina’s family’s garden (an obvious warning), Clementina refused to give in and marry a man she did not love. In fact, she hated him even more. And so, as they had promised, deep in the night, those who had found their love unsavory, murdered Giovanino. My grandmother was heart broken but even fear would not break her spirit. Emboldened by her anger and her grief she found there was only one thing left to do: go to America. Italy had broken her heart. Lucky for Clementina, her father was in America. He was in Niagara Falls, New York, working on the railroad. He welcomed her to come. Little Felicetta was very small when her sister left for America and just a few years ago she told the story of her sister’s last night in Italy, while my uncle and I interviewed her on film. Clementina had been sweeping the barn when her sister ran in and she stopped her work and held onto her and cried for what seemed to be hours and hours. They cried their eyes out; the littlest sister and the oldest sister. And then she was gone. After close to 90 years, the memory still makes my aunt cry. We were all moved to tears and it was at that moment that I realized the story of America almost always begins with goodbye. But fate would have it that for these sisters, goodbye would not be forever. For just a few years later, most of the family would be reunited in Niagara Falls. My grandmother also found much happiness and she did find love again. She bewitched yet another young man, Francesco Fortuna, my great grandfather and they lived happily ever after. 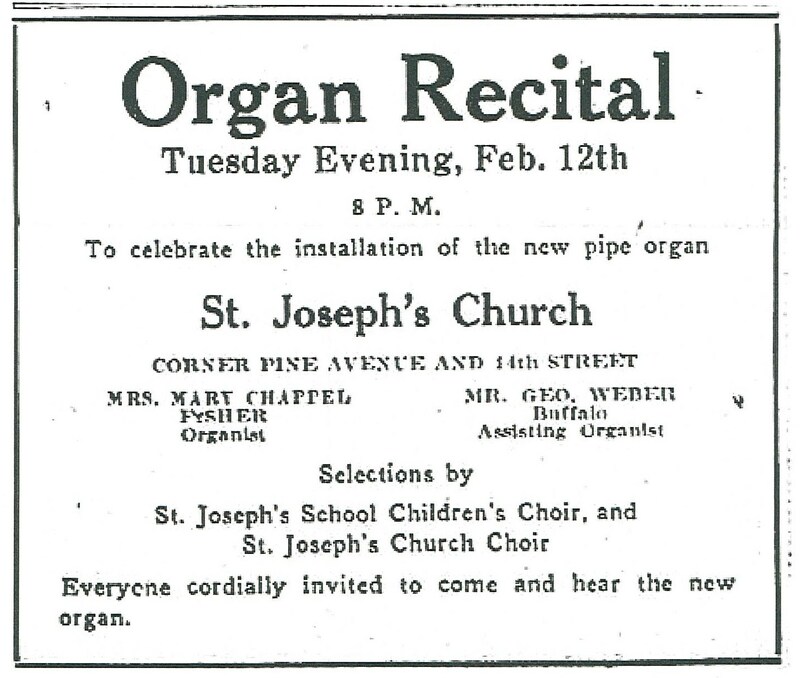 They were married at St. Joseph’s Church on December 12, 1923, and had two children: Gina (Jean Ann, my grandmother, and their first born) and Joseph (my uncle and godfather). They opened a very popular restaurant located on 19th Street, known as Fortuna’s and it is still there today. Clementina never forgot Giovanino. As complete as her new life had become she made sure we all knew the story. I like to think it was more of a story of who she had been across an ocean and in that other world that didn’t include automobiles or electricity. It was a place and time where love and magic lit up the darkness and in some strange way a piece of me was, in fact, there and remembers everything. I try to imagine what this special power might be that we all have, all of the first born daughters of first born daughters. Perhaps it’s the greatest power of all…the capacity to love completely and deeply no matter what the consequences. My grandmother’s little love affair with Giovanino is one of the only stories of her youth that has stayed with me. It speaks to me and to all of us and it says one thing: always choose love. I have much research to do on the rest of our mothers’ mothers. I will be ordering great amounts of microfilm from L’Aquila and hopefully visit one day. I wish I had more information on Giovanino. I would love to know more of him…this wonderful man, this Romeo, who always held a special place in my grandmother’s heart. 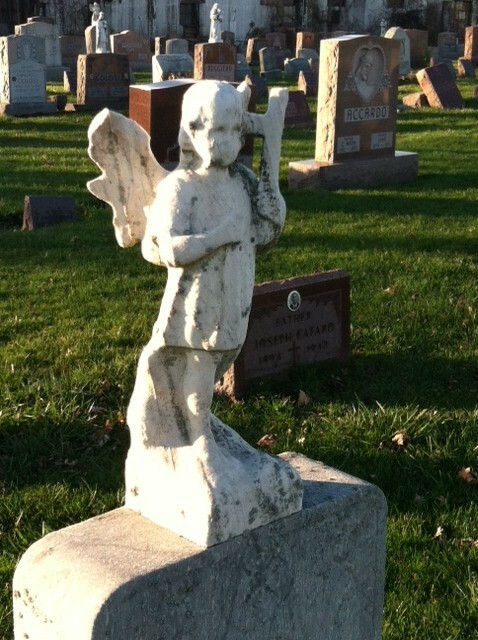 Another book from St. Joseph’s Cemetery contains the babies buried in St. Mary’s Section. This book covers 1942 to 1963. Again, pardon our blurry images. We had to photograph the pages as they were too fragile for a scanner. In the near future, these blurry pages will be re-photographed. 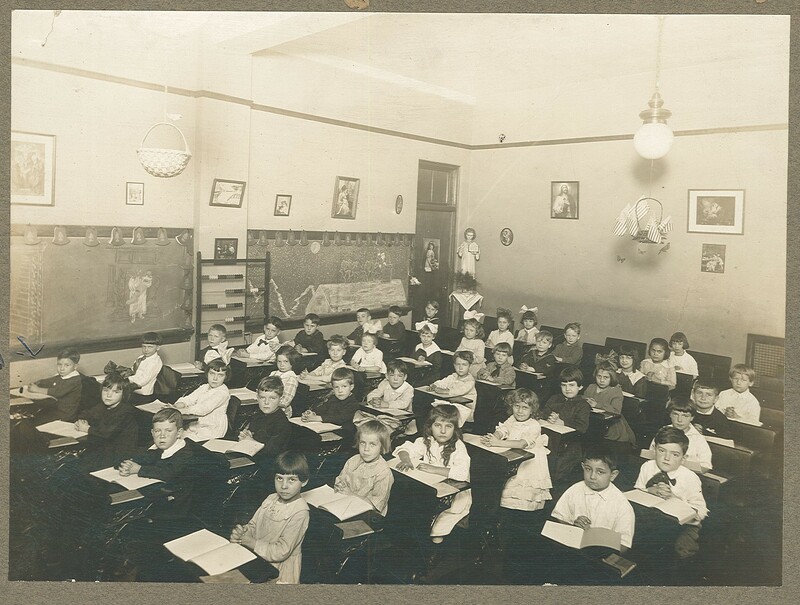 7th Grade class, St. Joseph’s School, Niagara Falls, circa 1920. 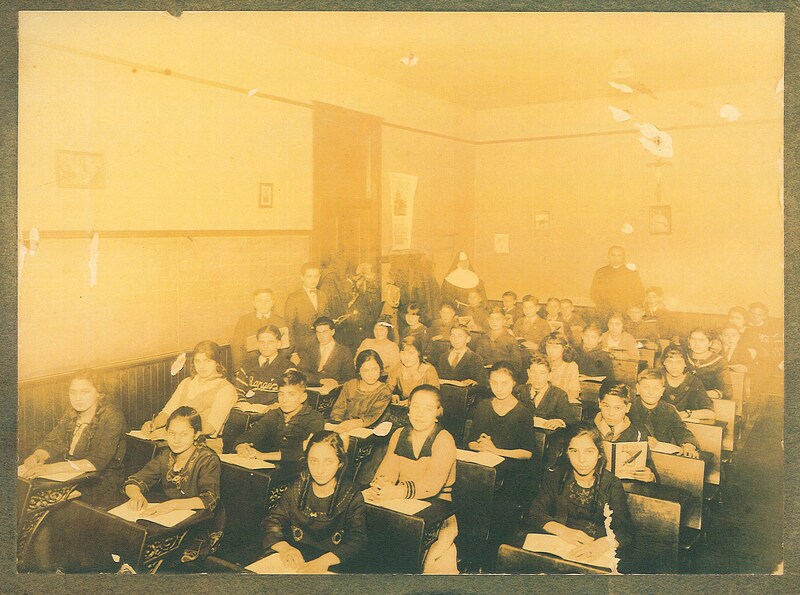 Frances Scrivano (Buzzelli) is the second girl seated in the third row of desks. 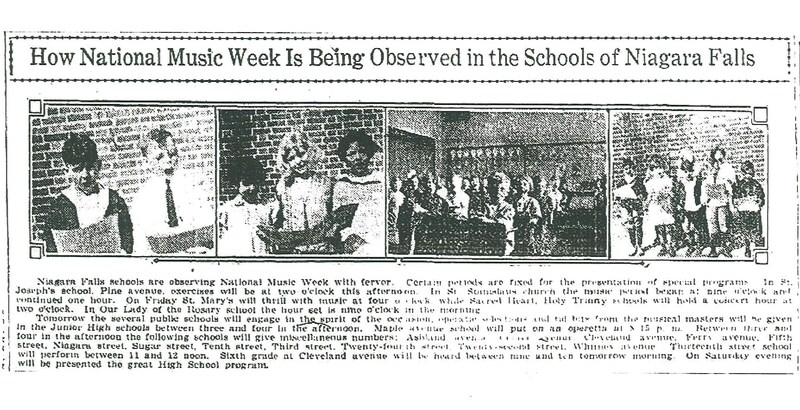 Click on this article from June 26, 1922, Niagara Falls Gazette. 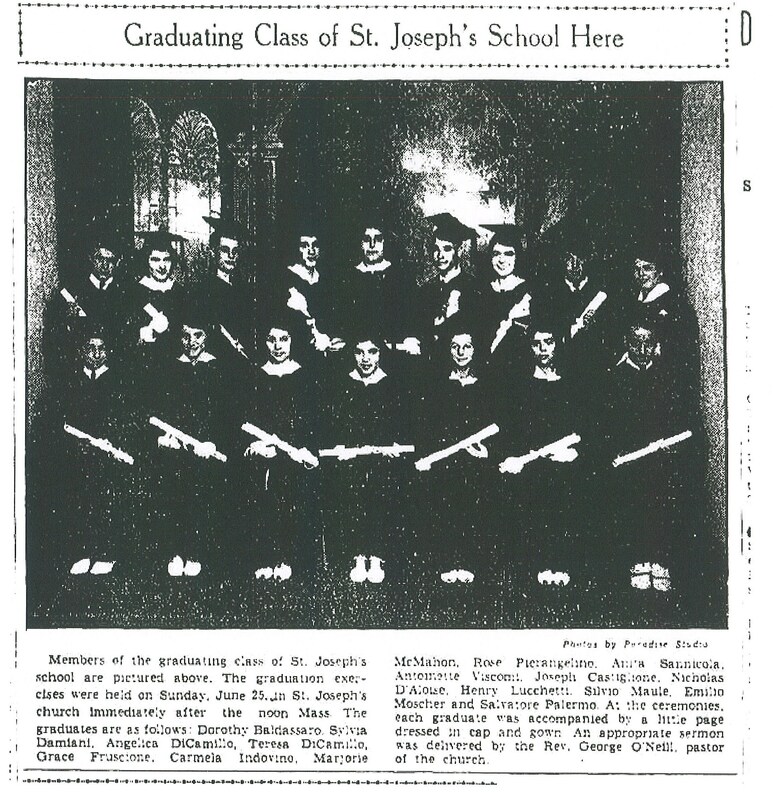 This was the third commencement service at St. Joseph’s School. Below are links to PDF files of our first book of St. Joseph’s Cemetery Records, Niagara Falls. Some pages did not come out so well and I will be returning to the archives to re-do those pages. Apologies! As you will notice, these pages contain mostly the deaths of children. There are many names that we all recognize. There are Bossos, Gallos, Sauros, Scarcellis, Ventry’s, Salvatores, Cardones, Rotellas, Valenti’s. There are also a handful of Spanish deaths and an Armenian or two. And take a look at Burials 5, August 10, 1927…”parts of a body in no. 77…worked in grave with the bodie…” A little mystery to solve with that notation. Of course, August is one of those warm months during which so many bodies (and parts) are found in the river. Bodies that had gone over Niagara Falls. This book contains people of all ages. As for the little children, though, it might be said that these records are the only proof that they ever existed. In fact it’s very sad holding these books and knowing the heartache that lives inside the lines. Below are pages from St. Joseph’s Cemetery Records, Niagara Falls, New York. Check back soon for an index and transcriptions.